One of the greatest dangers girls face in many developing countries is early or forced marriages. 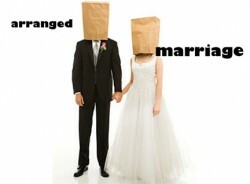 These are marriages arranged by the parents to a man the girls had never met before, and against the girl’s will. These arranged marriages take place when the girl is under 18. Many countries in not only Africa and Asia, but also in parts of Europe and in the Americas have carried on the traditions of forced marriage. Here are some very frightening statistics. According to Plan UK, 1,166,666 girls are forced into an arranged marriage every month. That comes down to 27 girls being forced into an arranged marriage every minute. And forced marriages are not just happening in the poorest countries in the world—they are also happening in Europe. In Turkey, as much as 14 percent of all girls are being forced into an arranged marriage, and in the Ukraine it is 10 percent. Why is this happening? This is largely due to very powerful traditions still prevalent in many countries, and also due to economic hardship among especially poor families. Many families cannot afford to feed all their children, so sadly the girls are the ones usually sacrificed. Regardless of traditional values and circumstances, it is wrong and horrid to let this practice continue. It ultimately deprives both girls and families of a chance for a better life by taking the girls out of school. It ultimately deprives girls of the chance for a good, healthy marriage of choice when they are at least 18, and forced marriages ultimately destroy the integrity of families. Despite all this, traditions die hard, and stopping it has become the necessary duty of law enforcement. But Plan UK, which is one of the largest child-centered community development organizations in the world, does recommend for those girls who fear they will be forced into an arranged marriage to carry a spoon with them. Many of these arranged marriage occur outside of Europe and North America, and so it means their parents or extended family will take them by airplane. Plan UK has recommended that if a girl carries a spoon on them they will set up the metal detectors, and that way they can get the attention of the authorities. This method has been tried before, but now some organizations are recommending this tactic so that girls being forced into an arranged marriage can escape. If this method will save the life of one girl from degradation and maybe even a premature death, then it is worth it. It is one of the saddest things that girls are forced into an arranged marriage. It sounds like something that should have ended centuries ago. Let us hope that this horrible practice can be brought to an end in our life times.